Michelle Williams (the Singer) Is Engaged to Chad Johnson (the Pastor)! If there’s anything I love more than a famous person announcing their engagement to another famous person, it’s a famous person who shares a name with another famous person announcing their engagement to a famous person who shares their name with another famous person. So when Michelle Williams (the famous singer, not the famous actor) announced her engagement to Chad Johnson (the famous pastor, not the famous football player), I was ecstatic. In fact, I still am. This is the Michelle Williams who joined Destiny’s Child alongside Farrah Franklin after the departures of LaTavia Roberson and LeToya Luckett—not Busy Philipps’s best friend. 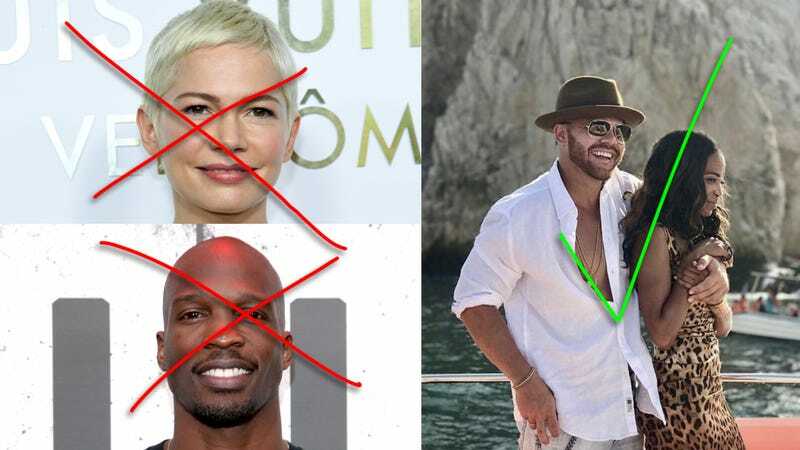 Williams has confirmed her engagement to Chad Johnson, an internet-famous “pastor and life coach” who does not play professional football or go by the name Chad Ochocinco, and who was not on The Bachelor. They’ve been dating for just over a year. If you would like to know more about this relationship—which, again, is between Michelle Williams (the singer) and Chad Johnson (the pastor)—head over to People, because they have all the exclusive photos of their engagement party and wrote some 1,500 words about the whole shebang.